Art Rastinehad, D.O. joined the faculty at Mt Sinai from North Shore LIJ and was previously a fellow at the National Cancer Institute. 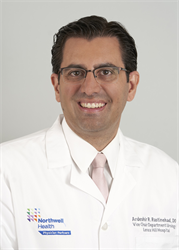 Dr. Rastinehad is leading the focal therapy and interventional urologic oncology programs at the Icahn school of medicine. He specializing in the surgical management of prostate, kidney, adrenal, and testicular cancer. He has a faculty appointment in the Department of Radiology and Urology. He has expertise in a wide array of interventional radiological and surgical techniques, including interventional urology, image guided procedures, laparoscopic and robotic surgery. Dr. Rastinehad completed his fellowship training at the National Cancer Institute, National Institutes of Health under the mentorship of Drs. Peter A. Pinto and Bradford J. Wood, pioneers in the research and development of new minimally invasive diagnostic and therapeutic interventions (focal therapy) for the treatment of prostate cancer. Dr. Rastinehad is the first dual fellowship trained urologic oncologist and interventional radiologist. Recently, he edited/authored the first book on this new sub specialty in urology titled 'Interventional Urology'.